I have seen wild geese today. Some on grassland, some flying above me, very low. They are big animals, indeed. And beautiful. Mostly greyish-brown, with black neck, head, beak and eyes, and white cheeks. Back at school, I had a friend whose family kept all sorts of animals, most of them running freely on their property. Her parents were both vets, and some or most of these creatures were left there by their owners as if her parents had an animal shelter. I remember that they kept geese and pigeons for the purpose of eating them. And I remember that I had a high respect of the geese especially. They were always so alert and hissed at any person coming near. But what I find most fascinating about geese, is their flying in formation. And that is, of course, what I see in this block. Posted in Uncategorized and tagged farmer's wife, farmer’s wife quilt, quilt, quilt block, wild geese, wild geese block. Bookmark the permalink. That’s a beautiful block. Was it difficult to make? Thanks! You ask if it was difficult to make. Can’t say no and can’t say yes. 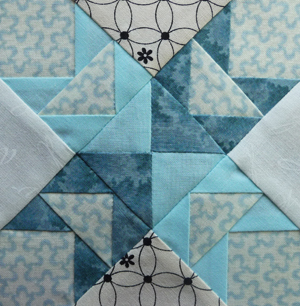 I did it in the paper piecing method for accurate seams.